On January 6, Ryan Porter and other representatives from Renaissance Downtowns addressed the Huntington School District Board of Education and made themselves available to answer questions. 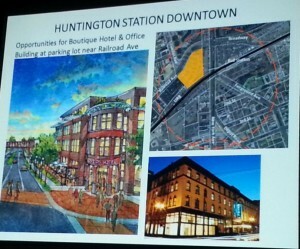 Renaissance Downtowns is the master developer that was chosen by the Town of Huntington in 2012 to help with the revitalization of Huntington Station. Sean McLean, Renaissance VP and Erika Forland from Source the Station took part in the presentation as well. “We are now in the planning and implementation phase, where will actually roll our sleeves up to implement some of these strategies,” he said. There are three things that Renaissance is planning to break ground on in 2014/2015. “Of all the ideas that were brought forth by the community, hotels are one of the only larger uses that are not allowed in the current C-6 Overlay District zoning,” stated Porter. The C-6 Huntington Station Overlay district is something that is exclusive to Huntington Station. “We would be adding a special permit to that district to allow for hotels.” He continued, “You still have to apply for the special permit, you still have to go through the site plan approval, the SEQRA Process. We still have a lot of work to do”. He invited community members to attend the monthly Source The Station meetings if they want to be part of the discussion of the types of amenities the hotels would have. 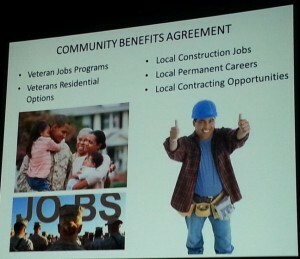 Porter discussed creating a Community Benefits Agreement. “We believe what we did in Hempstead was one of the most ground breaking Community Benefits Agreements in the country.” He continued, “for example, In the village of Hempstead, jobs was the number one priority. It was built into the actual zoning code, so it was law. Everyone who used the new code had to adhere to this new law and they had to hire locally based on percentage requirements.” Porter said they are currently working with the Town and some community members to put together a group that will put the community benefits agreement together. After Ryan Porter’s presentation the questions were opened up to the Huntington BOE. Huntington Superintendent Jim Polansky:Can you address the two primary things that we have to consider as an administration and a Board of Education. 1. The impact of the development process on school enrollment, and 2. The tax impact. The fact remains that this school district has taken a little bit of a beating over the years in terms of properties taken off the tax rolls and not receiving the full values on some properties. How do you see this development process as contributing to those two factors? Ryan Porter: First let me address the school aged children factor. Some of the initial developments you saw are not residential in nature. We do believe that apartments above storefronts, where young professionals and folks living in this area that maybe can’t afford a home yet would be a good thing. It is an idea brought forth by source the station members. In our other developments we focus on studios, one and potentially two bedroom units. Since we don’t have any proposals for residential developments at this point, we would have to work together on that. What I mean by that is you folks, because we are so transparent about our process, you will know very quickly whether we are looking to do any residential development and when we are planning on doing it. We are going to have to work together to determine what, if any, the potential impact would be. Any site plans would have to go through the NYS SEQRA process where we would have to measure all impacts. There are other issues such as sewer impacts that we would have to address. I guess to answer your question, I don’t have any numbers for you right now but I am excited to work together to determine what those impacts might be. To your second question from a tax perspective, one of the beauties of our development which we think is amazing, is we are looking to take, in most cases, municipally controlled, underutilized properties which have zero tax base right now and return it to the tax rolls. That is one of the benefits that we see. Each proposal and each development has different tax requirements so when the hotel moves forward we are going to look at the hotel and determine what types of rates we could charge in terms of room rates, and then we are going to determine what the taxes are going to be. Most folks understand that we need to make a profit on a development. So as long as we can make a profit and the Town can see it’s tax revenues, we are very happy moving forward with this. BOE Trustee Jen Hebert: Do you think Renaissance will be looking for some kind of tax incentives or abatements from the Town? I don’t want to see the hotel added to the tax rolls at some ridiculous percentage or PILOT. That has been a concern for our school district because in the past we have lost a lot of tax money to programs where the Town has offered incentives to people to set up in Huntington Station, only we never see those come back onto our tax rolls in a way that benefits the school district. I am wondering if Renaissance has intention of going to the Town to ask for some kind of tax incentives for the businesses that set up in H.S.? Ryan Porter: The short answer is I have no idea right now, so I don’t want to sit here and tell you folks what things are going to be or not be. I need to look at what the financial liability is going to be. At the same time that someone is saying how much are we going to get in taxes, a community member might say to me, when I have friends who come in and stay at this hotel, I want them to be able to afford it. So we have to weigh both sides of the equation and make sure everybody is as satisfied as possible with the process. Trustee Jen Hebert: The people in this community want nothing more than to see Huntington Station revitalized and to see businesses set up and to see that part of our community strengthened but you are going to meet with some cynicism and some suspicion because historically we have gotten the short end of the stick in our school district, so I just want to reiterate how important it is for you to be transparent and how important it is for you to be mindful of the fact that you have some community members who are ready for you guys to say something and do something else. We need you to be transparent and we need you to tell us the honest truth. Trustee Jen Hebert: You mentioned a special permit for the hotel and that raises red flags for me. My concern is setting precedent for putting up a 5 or 6 story building which is not what we are looking for in Huntington Station. When a special permit is granted to one business, it is almost impossible to say to all the other businesses, “no, just for them”. As a board member looking out for this school district and this community, we really don’t want to see a special permit being passed that is going to allow for a precedent for a several story building to be set. Ryan Porter: There is a very long answer to that but I can tell you the special permit that is up for consideration doesn’t change the underlying heights of the zoning district. Potentially a four story range hotel may be necessary for a hotel to be viable in this area. This special permit doesn’t mean someone will get the special permit, there is discretion as to whether someone receives a special permit. The Planning Board and the Zoning Board decided if they will issue the special permit and even then they still have to go through all the public processes. In addition to that there are criteria that restrict it to certain locations and certain sized parcels so it kind of prevents too much of that from happening. Superintendent Polansky: If the hotel is built and does not fly what happens to that structure? Ryan Porter: No one can ever guarantee that any development will be a success. The hotel is going to be a very large investment. There will need to be a significant amount of research done for an investor to provide loans. There are going to be a lot of folks with a lot on the line, just like this community that needs to make sure that the hotel in viable before it goes into the ground. There have been rumors of converting the hotel from one use to another. I guess there has been precedent in the past of two story hotels being converted to something else, but folks don’t go onto investments like that thinking there is an option to turn it into something else. I can tell you that that is never going to be the intention of this development company, but I can’t tell you that I can guarantee you success. Trustee Tom DiGiacomo: You brought up the Community Benefits Agreement and one thing I didn’t see in there is any benefit to the school district. Ryan Porter: Just to be clear, that was the Community Benefits Agreement in Hempstead. What’s important in Hempstead may not be important in Huntington or maybe it will. think it is a good baseline or a place to start. I would encourage and I would imagine that school board members would be part of this process. Renaissance VP, Sean McLean: In Hempstead, the school district hadn’t involved themselves in that but it doesn’t mean the school district here couldn’t be part of that process. Trustee Tom DiGiacomo: At a GHCG meeting I heard you say that you would only go through with a Town Board 5-0 approval, is that true?. Ryan Porter: It is a huge goal, “unanimous votes”. It should be written on our walls at Renaissance. It is something that our CEO Don Monti feels very strongly about. While it is not a requirement, it is a very strong goal. Trustee Tom DiGiacomo: With that said, and since our school district is in the middle of this whole project would you consider our voice in your votes? Ryan Porter: We could talk internally about that. Trustee Emily Rogan: There are a lot of school districts in the Town of Huntington but everything you guys are talking about and most other major development plans that have come down the pike directly impacts one school district. While many people say we want to bring downtown revitalization for H.S., they don’t live here and they don’t send their kids to school here. They could benefit from coming into the restaurants but they may not be experiencing any negative tax impacts of additional students that will need to be educated. We are the only district that would see any impact from this. Trustee Adam Spector: I think it is fair to say that most community members see the school district as a major stake holder, and while your presentation was very nice, it never mentioned the school. You are a for profit company. Every for profit company has a number one goal to maximum profits. With the shafted treatment that many people in this community feel they’ve received and we as school board members watching property going from generating tax revenue to coming off the tax rolls and a company like yours coming in and saying we can put it back on the tax rolls, the question many people have is why did it ever come off in the first place? What happens with something that may be as well intended as a hotel, the reality is that a lot of people view the hotel as a Trojan Horse. Once said zoning is put in place, although it is not your intention, people down the road may take advantage of the availability for 4 and 5 story buildings. While some may feel it is ok for a hotel, they may not feel it is ok for high density residential. As BOE members our chief concern is to watch out for the educational and financial welfare of the families that send their kids to our schools. We want to make sure that the schools are front and center in your discussions and considerations. Ryan Porter: While maximizing profits is important, doing the right thing is also something that we believe in. All I can do is to try to earn your trust over time. Trustee Adam Spector: How can you be so sure that other people have the same intentions as you do? Ryan Porter: Things have to be put into place for a hotel that can’t be taken advantage of for other uses. Sean McLean: It is important for people to understand that we don’t just build a hotel and walk away. This is not one off development. This is a string of 10 plus years of development and becoming part of the community. Trustee Adam Spector: There is wealth to be had here, I implore you to share that wealth with the school district so we can educate the kids who already live here and any kids that may arrive. We do not have the resources to educated more children. If there could be some sort of a CBA that guarantees that the school district shares in some of that wealth, that would go a long way in building the trust of the BOE and the people that we answer to in the community. Trustee Tom DiGiacomo: Do you have concrete plans yet? Ryan Porter: We do not, all we have done is some initial renderings for the hotel product. The goal is to get the special use permit in place and then begin to spend dollars on the site plans, etc. Trustee Bari Fehrs: Do you meet with the Town on a regular basis? How is your communication with the Town? Ryan Porter: I meet for multi-hour work group meetings every other week. Trustee Bari Fehrs: Is that something that the Board or the Superintendent can attend so we are a true voice? I think there are still a lot of people that still have no idea what’s coming down the pike. Ryan Porter: We need your help to get the word out. Superintendent Polansky: The biggest issue we have, is that while I know you would love the board to jump on this and promote it, and this is not necessarily related to Renaissance specifically, but there has been too many times in the past where one thing is said and another thing is done. It has to be we believe what we see not what we are told with respect to this whole zoning process. There are people in this community who fear if that hotel does not do what it is supposed to do, that a change in zoning law would lead to an influx of high density housing or something of the sort. That would impact this district in numerous and not necessarily positive ways. I think the best way to get support from this board and the community is to let them see something concrete. The words can only go so far. Ryan Porter: I understand. I have fractions of the community that are saying, let’s go and other fractions of the community saying, wait slow down and make sure you have everyone’s input. Trustee Jen Hebert: Take a look at what happened a couple of years ago when they tried to do a Transit Oriented District (TOD). That will speak to the lack of confidence from us and the community. Trustee Xavier Palacios: There is nothing more that we would like to see than for you succeed and do what you plan to do but I would also like to see it done fairly. I reached out to you last year and you told me that you would be willing to negotiate a Community Benefits Agreement. You just told us here today that you already started negotiating a Community Benefits Agreement with several people in the community. I would like to know who these people are and understand why the major stake holder in this community, which is our school district, hasn’t been approached and asked if we would like to participate in this process. I would think that this would be the first place that you should go. Ryan Porter: I just want to make it clear that we haven’t started negotiating a CBA. We just reached out to community members to see who should be part of the process. There is a lot of vying that occurs during this process where people are struggling for power and we have to make sure it is done in a proper way and that it is also done in an efficient way. Trustee Xavier Palacios: Our trepidation in our community is what happened in the past. My particular trepidation is that I haven’t seen you build anything. As much as you say and what you show us on a screen, I haven’t seen anything happen. We really haven’t seen you guys build anything. Ryan Porter: We have over 80 completed construction projects on Long Island. Trustee Xavier Palacios: That Renaissance has built? Ryan Porter: Renaissance has been an entity for only about 7 years. Before that Don (Monti, CEO) had over 30 years of building things. What we have done with Renaissance is used Don’s expertise from the last 35 years, brought all the experts from around the country together to say how do we bring all these components together to revitalize downtowns. Xavier Palacios: I’d like to see you break ground after you tell us the totality of the project. I’d like you to show us exactly what you intend to build. Tell us what the square footage of these lines that you showed us today. From the Village to 11th avenue, what is the total footage of your redevelopment plans? I can’t imagine that all you intend to do is build a hotel and I’m sure you have a market analysis. I am a little surprised that you would start on a piece of the project and not tell us about the entire project and what you plan to do. I understand that you want feedback from the community and you want everyone to have some say in what happens, but you are the expert, you were hired to be the developer and give us a plan but all I see is a hotel. Ryan Porter: To be clear, we were not hired. We are not seeing any checks from the community. We are spending all of our own dollars with this process. I have made it very clear that in 2014 we are going to be working on Master planning efforts. Sean McLean: We’ve laid out strategies to try to revitalize, there is no plan and we can’t be clearer about that. The plan right now is to address the already zoned properties to the north of the tracks that are already hooked up to the sewer district and to work with the sewer district to see if there is even capacity. There is nothing, there is no secret plan. There is simply not a plan and we have to go through these efforts with the community. There are concepts, of medial office and commercial offices, concepts of apartment above retail, concepts of downtowns and restaurant rows and we have done feasibility studies on a number of them but we have a very long way to go. We certainly want the school board to be part of that. This is the beginning of that effort. Trustee Xavier Palacios: You’ve invested millions of dollars already so clearly you have an inkling of what you think Is going to be happening here. Would you guys be willing to come to some kind of a Community Benefits Agreement before you had any zoning law changes. Ryan Porter: Our practice has typically been to create a CBA before we break ground on anything. Trustee Xavier Palacios: Why can’t we do a CBA before we had a zoning law change? Sean McLean: In Hempstead we had zoning and SEQRA done prior to the CBA actually beginning which I think was a mistake. We need to start the CBA talks now, prior to zoning and SEQRA. We are not necessarily in charge of this. The municipality is part of this process. It is not just up to us because it has to be passed into law. Superintendent Polansky: I think it goes back to generating trust that includes all the parties, not just the individuals sitting in this room. To get the school board to buy into a project like this, there has to be some sense of sure thing in terms of what benefits come to the school district. Ryan Porter: What’s exciting about this community is that folks are passionate and willing to be involved. That’s why we are happy to get all the folks at the table and then we can come up with something that makes sense. 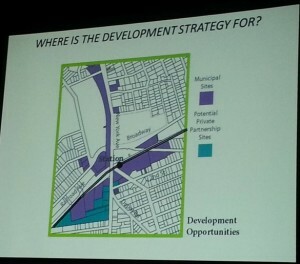 Trustee Bill Dwyer: How much skin in the game does Renaissance Downtowns have? Right now you are spending a lot of your own money, how are you going to make your money back? Who is going to spend the money because those are the people we want to be engaged with. Are you going to build the hotel? Ryan Porter: I don’t know yet, we are not necessarily general contractors. Right now I am looking to get concrete things in place for the Northridge center, for the hotel. As we get things in place, and I start working on financial models, builders. All that stuff is going to come to fruition, of who the players are. Trustee Bill Dwyer: What I wanted to hear from you is that you are going to front all the money that you believe is this project so much. I didn’t hear that from you. I’ve heard from other communities, that you sell your ideas but you don’t put your own capitol at risk. You let others do that and if they don’t succeed it’s not killing you. Ryan Porter: We are not going to cut and run. This is our legacy on the line. When most people do a hotel they don’t put all the equity in themselves, they have partners, and loans. Renaissance Downtowns plans to come back to to give updates at future BOE meetings.